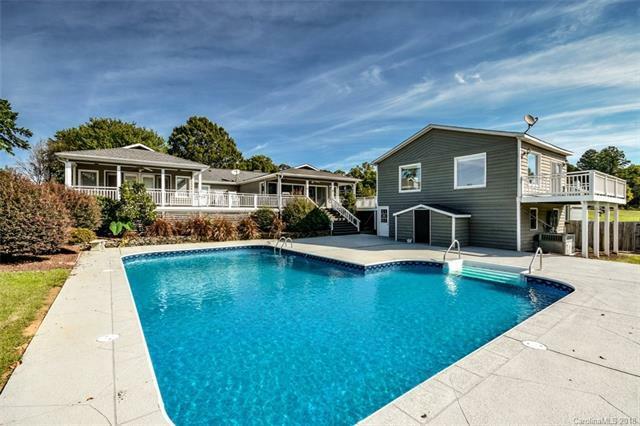 Beautiful Waterfront Ranch with In-Ground Pool & NO HOA's! Great Open Floor Plan For Entertaining & Enjoying All That The Lake Has To Offer. Additional 584 sq ft Heated & Cooled Living Space Over the 2 Car Garage For Game Room or Guest Room. Huge Master Bedroom W/2 Walk-In Closets, Spa Like Bath, Sliders Out to The Expansive Covered Deck Overlooking The Pool & Lake. Large Secondary Bedroom Boasts Full Bath, Large Kitchen w/Breakfast Bar & Tons of Cabinet Space, Bright Open Great Room w/Fireplace, Beautiful Wrap Around Deck For Peaceful Views of The Lake. Freshly Painted Inside & Out! Home Has 3 Bedrooms, Septic Showing 2 Bedrooms. Very Sought After Central Location on The Lake w/Low Iredell County Taxes & Award Winning Schools.